The Global Food Security programme website is managed by the Biotechnology and Biological Sciences Research Council (BBSRC). We are committed to ensuring that our website and online resources are accessible to everyone, no matter what their ability. CSS 2.1 and CSS 3.0. 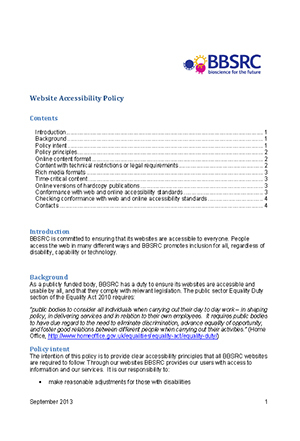 BBSRC is committed to ensuring that its websites are accessible to everyone. People access the web in many different ways and BBSRC promotes inclusion for all, regardless of disability, capability or technology. We have mainly used colours that make the webpages easy to read. You can, however, change the website’s background colour and the colour of body text in your browser or operating system. For instructions please visit the BBC’s ‘My Web My Way’ pages on How to change text and background colours. We try to ensure that the colours used on our website meet the minimum contrast requirements in the W3C Web Content Accessibility Guidelines (WCAG). The contrast ratio for normal text is 7:1 and for larger text 4.5:1 in the WCAG AAA success criteria. On our website colour is never used as the only visual means of conveying information or indicating an action. PDF and Word documents are used across the website to complement content when needed. The majority of our PDF documents have accessible structures with bookmarks, page tagging, and image alternative text. If you find a PDF document on this website that is not accessible and you need it in an accessible format, please email web@foodsecurity.ac.uk. Download Microsoft Word Viewer software. Where document downloads are available on our website, the link text will indicate what type of file it is as well as the file size. Link text displays in this format: “Document title (File type file size)”, for example “Accessibility policy (PDF 259KB)”. Documents open in a the same window. All images on this website are accompanied by brief alternative text which describes the image or its function. The alternative text (ALT text) is generally only visible when the browser’s automatic image loading feature is turned off. Images that are used for design or layout purposes do not have descriptions. We try to name all links clearly and descriptively so that they are comprehensible when read or listed out of context. Links to other websites and documents open in the window that you are using. Over recent years we have seen an increase in the number of users visiting our website from mobile devices. Our website has a responsive layout which optimises viewing across a range of devices from desktop computer monitors to tablets and mobile phones. Webpage content scales according to device to provide easy reading and navigation with a minimum of resizing, panning, and scrolling. To navigate through links on an individual web page you can use the ‘Tab’ key on a keyboard. To make it easier and faster to get to the page content we have added a link that lets you skip past the navigation and land on the beginning of the content on the page. The ‘Skip to content’ link appears when tabbing onto our website with a keyboard, or when viewing a list of webpage links via a screen reader. We also have a ‘Skip to navigation’ link that lets you skip to the website navigation. The ‘Skip to navigation’ link appears when tabbing onto our website with a keyboard, or when viewing a list of webpage links via a screen reader. Use your browser’s print function to print our website content. The pages have been set up to print without the page navigation elements. You can customise text size through your browser settings. if you have a mouse or other pointing device with a scroll-wheel, hold down the Ctrl key and move the wheel away from you to increase zoom, or move it towards you to decrease it. choose “Page” then “Zoom” and then a percentage. Further information on increasing the text size can be found on the BBC’s ‘My Web My Way’ website: How to make your text larger. Our videos are hosted on YouTube and embedded in pages on this website. We use cascading stylesheets (CSS) for the visual layout of our website. If your browser or browsing device does not support CSS, or if you turn CSS off in your browser, you should still be able to read the content of each page. For more information and a comprehensible guide explaining the many ways you can change your browser, computer, keyboard and mouse settings to make the web more accessible to you, please visit the AbilityNet website. Whilst we have tried to ensure this website is accessible, you may encounter some limitations. Some content may be technical or scientific in nature and may require further understanding. If you have any difficulty viewing the content or are experiencing problems accessing areas of our website, please email web@foodsecurity.ac.uk. For advice on what to include in your email, read guidance from the Web Accessibility Initiative, W3C: Contacting Organizations about Inaccessible Websites. We will make every effort to resolve any issues.